Over 2,000 Sf Above Grade With Fully Renovated Interior And Yard. Newly renovated open concept cottage located on beautiful Three Mile Lake. Offers 2084 square feet of family space with vaulted ceilings, 3 bedrooms, plus loft and 2 bathrooms. Master bedroom enjoys a private ensuite with walk in shower and waterside walk out deck! Situated on 1.75 acres of land this beautiful cottage offers 260' frontage with sunny southwest views of Three Mile Lake. Both shallow and deep water off the dock. Exterior spaces completely re-finished with large fire pit area, a gentle slope to the water's edge and additional seating area at water front. Incredible water views. Located on a quiet section of the Lake in Green Bay. Also located directly across from a family friendly resort beach that welcomes cottagers - great for kids! 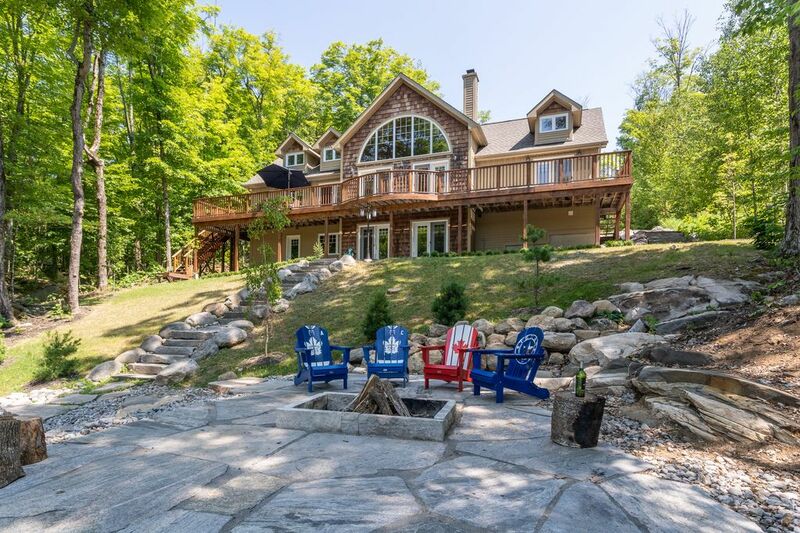 Located just 20 minutes from Bracebridge and Port Carling. Close to Shopping, groceries and LCBO. We are Chris and Lisa Knighton. We purchased this cottage after searching for two years and fell in love with the property. We decided to renovate a few things on the interior, but we focused mainly on making the exterior space more enjoyable for our family and guests. We're excited to share our home away from home with families that will enjoy the space and take care of it as their own. Our neighbours are incredible! We're very easy going and accommodating. We've always loved Muskoka and jumped at the opportunity to be on a smaller, family friendly body of water in 3 Mile lake. Not to mention the fishing is incredible for large walleye, smallmouth and largemouth bass. Longhorn Lodge is off the beaten path but also close to Bracebridge and Port Carling. It's located in Green Bay on Three Mile lake with fantastic fishing and swimming right of the dock! The lake is a smaller body of water compared to the Big Three, but still big enough for fishing, water sports, tubing and just ripping around on Jet Skis/Boats - and perfect for paddle boarding, kayaking and canoeing. We really enjoyed our two night stay in mid October. The colours were fantastic and the outdoor space was awesome. We really liked having a wood burning fireplace for the cooler evenings. Looking forward to coming back again in the future with our family. Thank you for a great experience, Lisa! Absolutely beautiful. Most peaceful experience I have had in ages! Property was beautiful and clean. Safe walkway down to the giant dock on the water. The scenery is second to none. Very quiet on the dock. Loads of nature, beautiful surroundings. Would highly recommend this property to anyone looking for a nice relaxing time. I will be doing my best to book this cottage again. This cottage property has been beautifully updated and landscaped. We came to go on the Muskoka arts tour and also spend some time doing typical cottage things. We were not disappointed by either. Pretty well anything that we could have wanted in a cottage was included, from a canoe and life jackets, to a fire pit, a large kitchen and nice gathering area. If it had been bad weather and we had been staying longer I'm sure we would have appreciated the satellite TV. The layout was good with a good mixture of privacy and togetherness. I highly recommend this place. The pictures on the ad we’re beautiful, And the cottage did not disappoint. Lake was warm for the end of May. Kids had a blast. Outdoor firepit was large enough for everyone to fit around. Would definitely recommend! What a beautiful place and great layout!! We had tons of room with five adults and four kids under 5. There was lots for the kids to do and when not outside, they had a blast in the loft area with the toys and cartoons that were left for them to enjoy! We did some snowshoeing in the trails just across the street! The weather was gorgeous and the view was breathtaking! We sat on the deck and enjoyed every minute of our family weekend! Thanks to Lisa who was always available to answer our every question!! Very good setup - highly recommend!! Peaceful. Clean. Beautiful home and view! Perfect place for families, couples, girls weekend,or even a solo escape for peace and tranquility. Everything you could need. Incredibly bright, clean and spacious. Decor is tasteful, simple and appealing. Lovely first experience. Will definitely return! Thank you Lisa! !